The Time Living Tetras bed frame is available in four standard UK sizes including single, small double, double and king size. This contemporary bedstead is a mixture of strong metal and decorated with light beech effect corner posts and a silver frame. 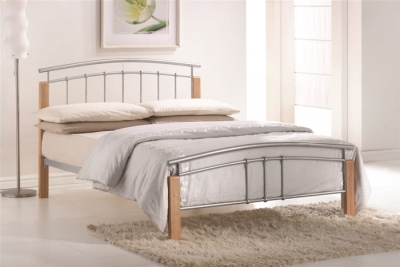 This stylish bedroom piece of furniture has a tall curved foot end and headboard with straight bars in the centre panels.This fashionable addition to the time living collection has the classic sprung slatted base designed for your comfort and built as a platform for a standard UK mattress.